Our range of professional Hygiene Brushware, Squeegees and Handles is manufactured to the highest specification and standards expected by the hygiene industry worldwide. Sourced from European manufacturer, Brosserie Thomas SA, and exclusively distributed in the UK the brushware and squeegees provide an ideal synergy with our own high quality products. Made only from materials approved under French law, in excess of the standards required by EU norms, the products in this range are innovatively designed and manufactured for purpose and ease of use. Brushes are supplied individually wrapped and free of markings on the surface, with food approved polypropylene backs and durable, tightly packed PBT bristles secured with stainless steel wire and are ideal for use in sensitive environments. Products in this range comply with the French Professional Hygiene Brushware Charter (contact no. F77T1) compiled under document no. 1227 'Materials in Contact with Foodstuffs, Cleaning Products and their Materials' published in the Official Journal. The range also conforms to the European Professional Hygiene Brushware Charter of the FEIBP (contact no. FR-500). Manufactured in France under ISO9001:2000 quality procedures audited by SGS. Polypropylene nail brush with PBT bristles. Stainless steel chain with two hooks for securing nail brushes at wash stations. 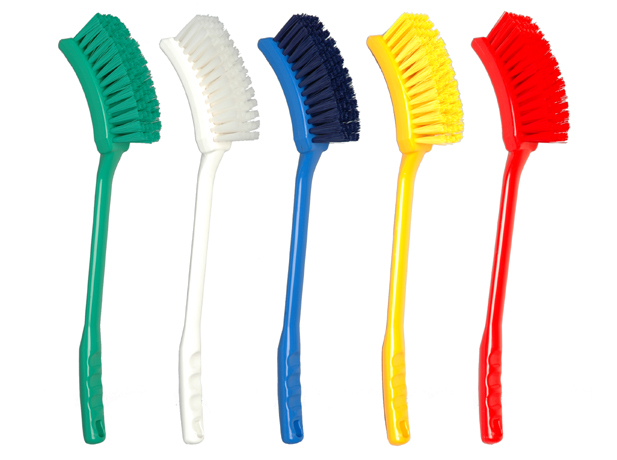 Polypropylene back designed for comfortable palm grip with coloured medium PBT bristles. Polypropylene back designed for comfortable palm grip with flared coloured medium PBT bristles. Polypropylene back designed for comfortable hand grip with medium PBT bristles. 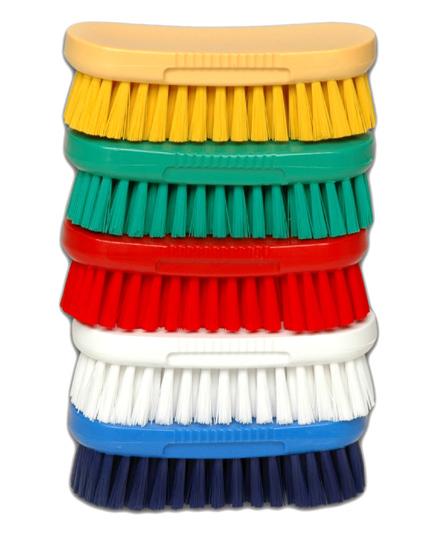 Polypropylene back designed for comfortable hand grip with coloured medium PBT bristles. 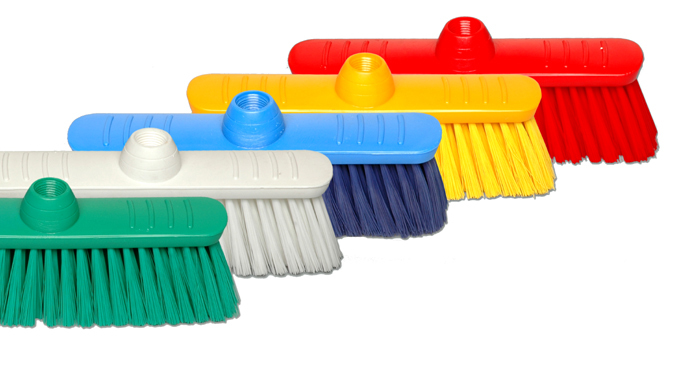 Polypropylene back designed for comfortable palm grip with coloured soft PBT bristles. Available in blue, green, red, yellow and white only. 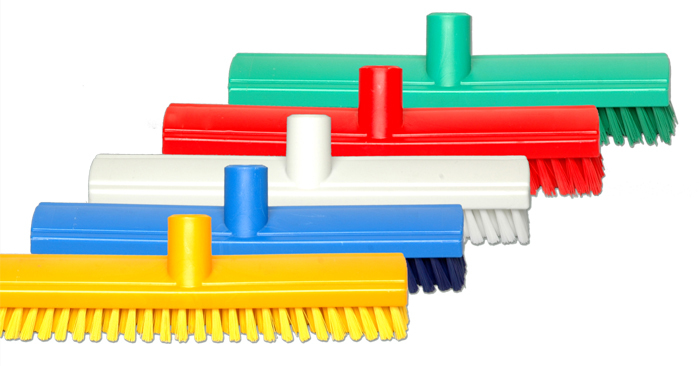 Polypropylene back designed for comfortable palm grip with coloured medium PBT bristles. Available in blue, green, red, yellow and white. 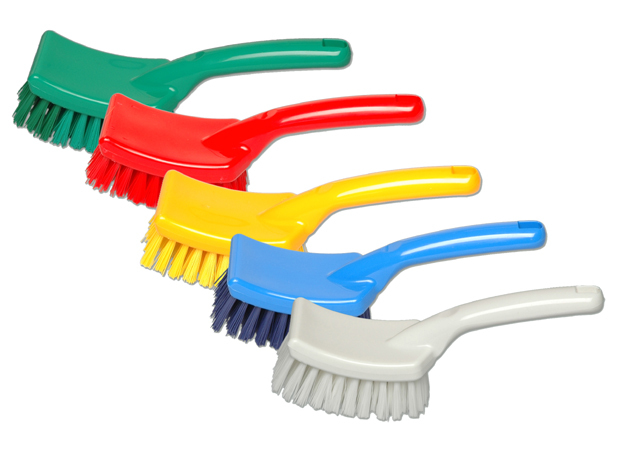 Polypropylene back designed for comfortable palm grip with coloured soft PBT bristles. Available in blue, red, green and yellow. 30cm hygiene polypropylene back designed for comfortable hand grip with stainless steel wire bristles. Available in white only. 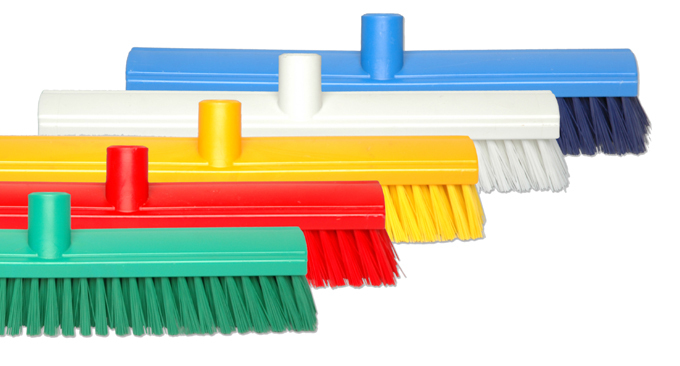 26 cm polypropylene back with strong, angled screw thread and coloured stiff PBT bristles. 31 cm polypropylene back with strong, angled screw thread with coloured PBT bristle. Available with medium bristles and stiff bristles. 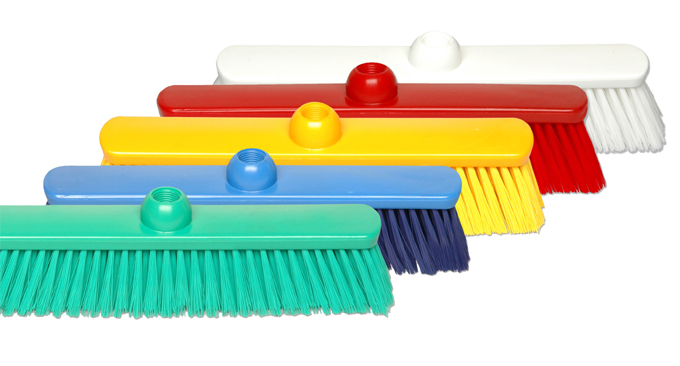 37 cm polypropylene back with strong, angled screw thread with coloured stiff PBT bristles. 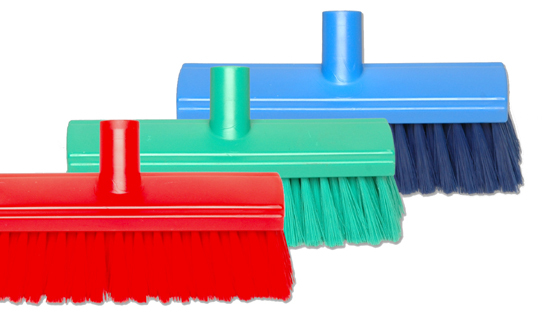 Broom, soft bristle 26cm polypropylene back with strong, angled screw thread and coloured PBT bristles. Blue, green and red only. Broom, soft bristle 37cm polypropylene back with strong, angled screw thread and colour PBT bristles. Blue, green and red only. 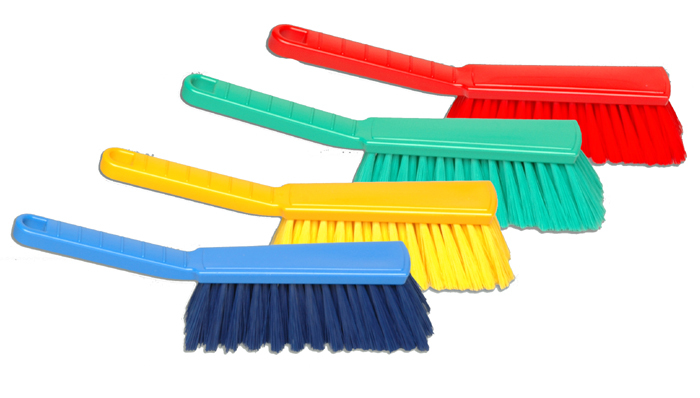 Broom, soft bristle 60cm polypropylene back with strong, angled screw thread and coloured PBT bristles. Blue, green and red only. Broom, medium bristle 29cm polypropylene back with strong, angled screw thread and colour PBT bristles. 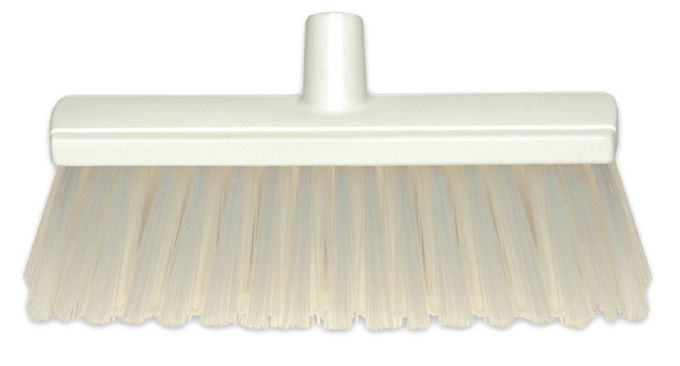 Broom, medium bristle 38cm polypropylene back with strong, angled screw thread and coloured PBT bristles. Available in blue, green, red, yellow and white only. 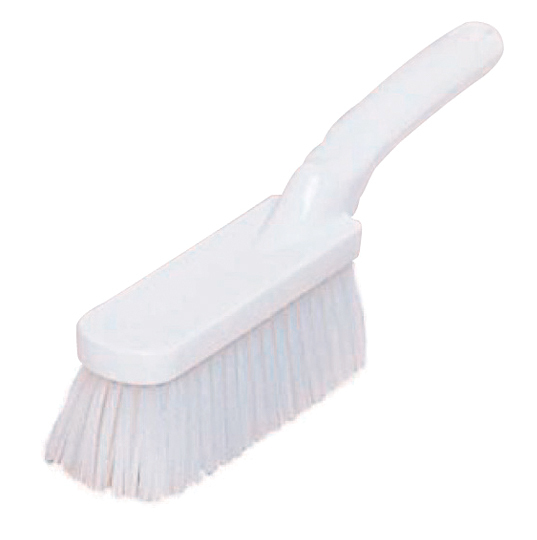 Broom, medium bristle 45cm polypropylene back with strong, angled screw thread and coloured PBT bristles. Yard broom with 30cm polypropylene back with strong screw thread and white stiff PBT bristles. 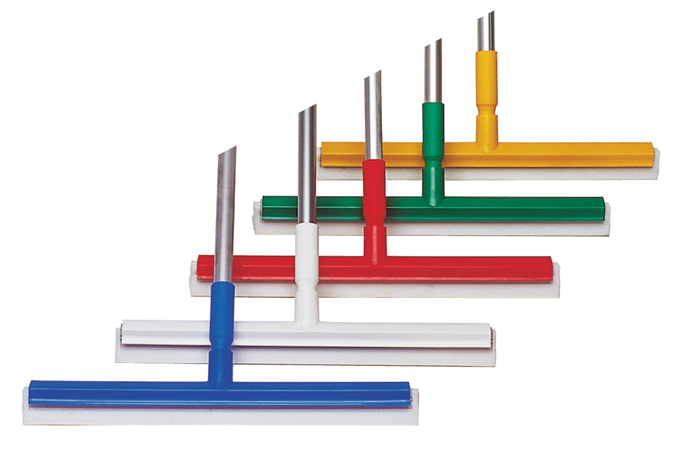 High quality squeegees from France’s leading manufacturer of hygiene brushware. Made to strict quality standards and featuring interchangeable foam blades or fixed rubber blades, or a lightweight, economy version. Durable construction with replaceable blade. Ideal for removal of liquids and light substances from floor and machine surfaces. Durable polypropylene frame, replaceable blade. Ideal for removal of liquids and light substances from floor and machine surfaces. Durable polypropylene frame with replaceable blade. Ideal for removal of liquids and light substances from floor and machine surfaces. 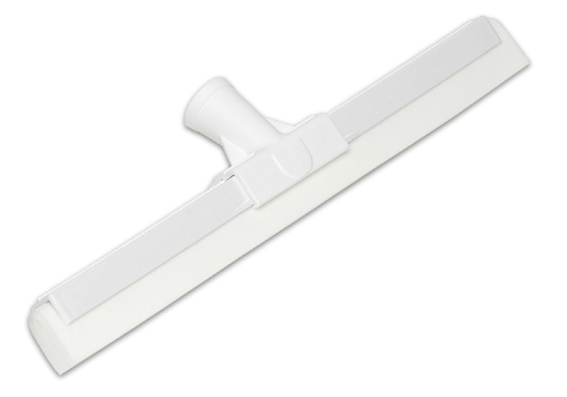 Lightweight, cost effective squeegee with polypropylene back and single use foam blade. Ideal for removal of liquids and light substances from floor and machine surfaces. Available in white only. Highly durable polypropylene squeegee with integral rubber blade. Ideal for smooth floors and surfaces. Ideal for removal of liquids and light substances from floor and machine surfaces. Available in green or white only. Highly durable polypropylene squeegee with integral rubber blade. Ideal for smooth floors and surfaces. Ideal for removal of liquids and light substances from floor and machine surfaces. Available in white or blue only. Highly durable polypropylene squeegee with integral elastomer blade, fitted with a short handle for tabletop use and other flat surfaces. Ideal for removal of liquids and light substances from floor and machine surfaces. Available in HACCP colours. 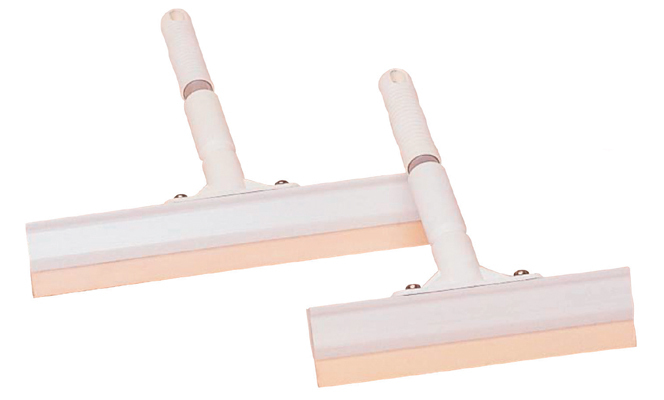 Unique squeegee and floor scrub combination tool set in durable white polypropylene with coloured PBT bristles and integral elastomer blade. Ideal for removal of liquids and light substances from floor and machine surfaces. Available in blue, red, white only. 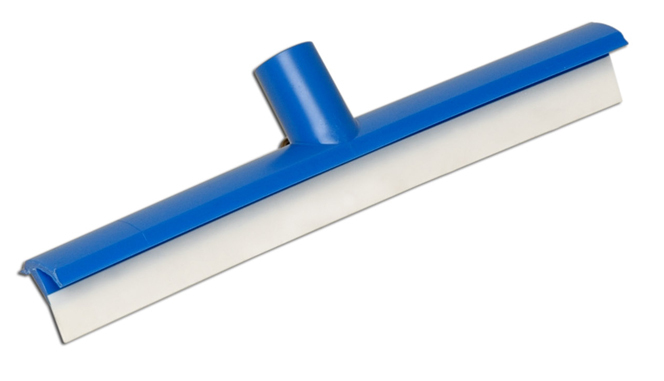 Monobloc single blade squeegee ideal for removal of liquids and light substances from floor and machine surfaces. 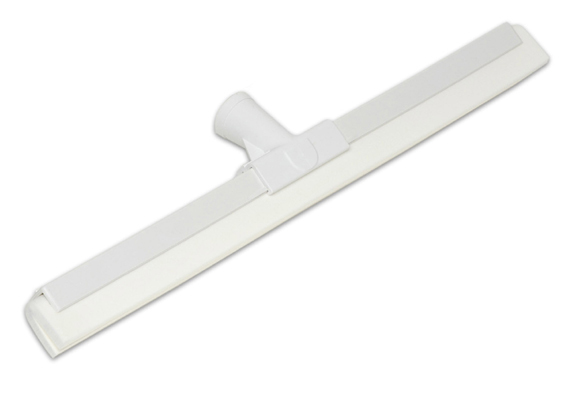 Monobloc single blade squeegee ideal for removal of liquids and light substances from floor and machine surfaces. Available in white, blue, red, green, yellow. 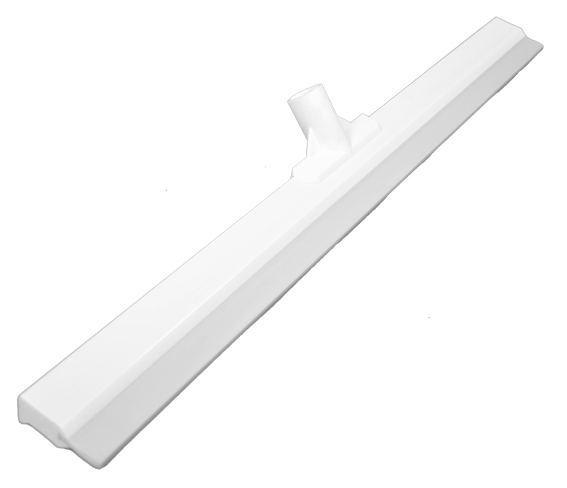 One-piece moulded polypropylene handle. 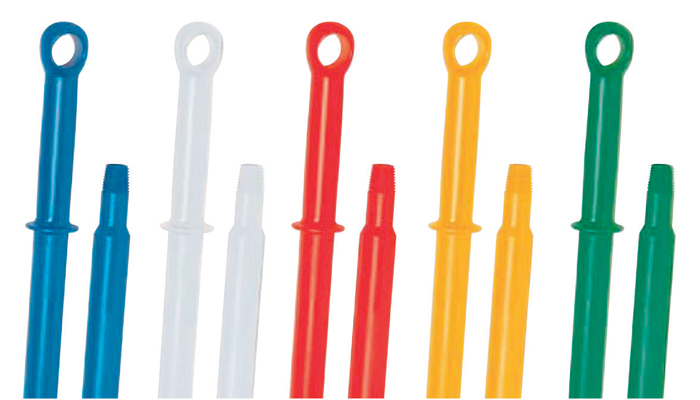 Durable moulded plastic handle in one-piece ideal for high standard hygiene applications. 32mm diameter. Versatile, high quality anodised aluminium handle with coloured plastic end cap and thread. 25mm diameter.